يحظى فندق Alpine Pacific Holiday Park بمكان متميز في محور المدينة والاستمتاع بـ شواطئ, رياضات, سياحة في هذه المنطقة الفاتنة. يحظى هذا الفندق ذو 4.5 نجمات بمكان ممتاز يسمح بالوصول إلى المعالم السياحية الأكبر في المدينة، فهو يبعد مسافة 0.4 Km عن صخب المدينة. يوجد العديد من المعالم السياحية الأكثر جذبًا للسياح في هذه المنطقة. يعمل Alpine Pacific Holiday Park على ضمان إقامة مريحة لضيوفه من خلال خدماته الممتازة وحسن ضيافته. يمكن للنزلاء الاستمتاع بالميزات التالية: مجهز لذوي الإحتياجات الخاصة, محطة شحن السيارات الكهربائية, خدمة التنظيف يوميًا, تأجير واي فاي محمول, واي فاي مجاني في جميع الغرف أثناء إقامتهم في هذا المكان الرائع. ادخل إلى واحدة من الغرف 23 وتخلص من عناء نهار طويل بمساعدة مجموعة كبيرة من الخدمات كمثل تلفزيون بشاشة مسطحة, سجاد, قهوة فورية مجانية, شاي مجاني, بطانية كهربائية الموجودة في بعض الغرف. يقدم الفندق العديد من الفرص للاستجمام كمثل حوض استحمام ساخن, حمام سباحة خارجي, حديقة. مهما كانت أسبابك لزيارة المدينة، فإن Alpine Pacific Holiday Park هو الخيار الأفضل لإقامة مثيرة وممتعة. Great room but quite a walk from main part of town where the bus drops you off. My main issue was that there was an incredibly bright light right outside the room that made it impossible to sleep. I spoke to reception who said they would talk to management about turning the light off but this didn’t happen. I only managed to get around 2-3 hours sleep per night. Very helpful staff is always a bonus. Great location, close to supermarket and takeaway,great bakery next door! Hot tubs along with all others facilities were spotless, BBQ and camp kitchen. 1 bedroom unit was wonderful with dishwasher and wifi. 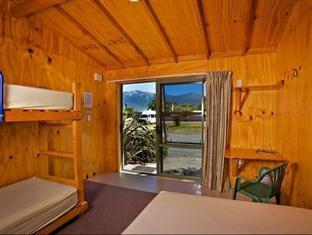 We stayed here for one night as we were in town for whale watching. 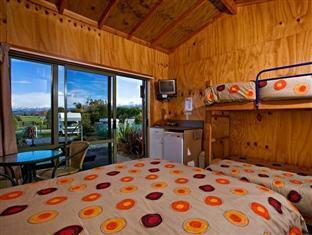 We stayed in a deluxe cabin and it was clean, but extremely hot in the afternoon (ceiling fan didn’t quite cut it) and very overpriced for what it was, it’s the most expensive place we stayed at in NZ and you have to remember it’s in a caravan park and there weren’t even any basic products in the bathroom! Would look for better value elsewhere next time. You are on a camping site for motorhomes and it is set up for these, accordingly the toilet block was 50 metres from the room across the parking area. Kitchen had no utensils , plates or cups but you could rent these, can't they accept a few may get pilfered and use 1/2 - 1% of the cost to cover this. Stay at upper floor for 8 people. This place have nice view. Clean and new. value for money. 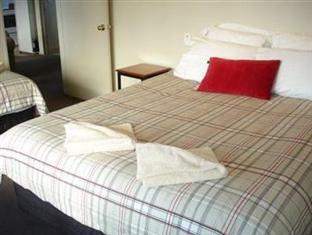 not the cheapest around but you get a nice comfortable apartment like place to stay. looks new inside out with helpful staff. We were originally staying in the basic hut but upgraded so that we could have an ensuite. The upgraded room was comfortable and a good size with a little kitchenette area. We were only there for one night though so just walked down to a restaurant instead. Reasonable value given that it was peak season. We are a family of 5. We liked the spacious 2 bedroom apartment with kitchen utensils supplies more than we need. This was the only place we did our cooking during our stay in NZ. Our apartment was on the 2nd floor. It did give a little problem to send our heavy luggage bags up. However, we were also assigned a carpark space right in front of our staircase. We still found it convenient as we could keep those less frequently used bags in car, and we could go down to get stuff when we really needed easily. I liked the view on the 2/F. My kids enjoyed the hot tubs and the swimming pool there too. They had a great time there after back from going-out, and they had made friends there too. 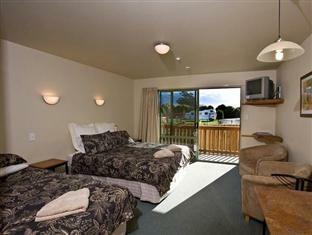 I found Alpine Pacific Holiday Park a comfortable and cozy place to stay. Wouldn’t stay here again or recommend. Room felt pokey & stuffy in spite of the fan which was on a timer. NOT good value for money at all. Needs a basin for washing dishes. Quite noisy at night. Helpful front desk staff. Superbly clean unit with everything we needed. Very central location with fab hot tubs (pool out of action for the winter). Very clean facilities from well set up camp kitchen, ablution block to cabin. Friendly obliging reception staff. Lovely location quiet. It's not horrible, but we'd definitely find something else if we were in the area again. The room was alright, but the bed wasn't comfortable. The heater in the room was noisy and could barely heat up the room. Good points being it was clean, had free hot tub and Swimming pool.